Traffic barrels line the shoulder of I-5 where the barrier is about to be installed. An update from the freeway beat: The contractor stringing a cable barrier up Interstate 5 appears to be moving faster than expected. 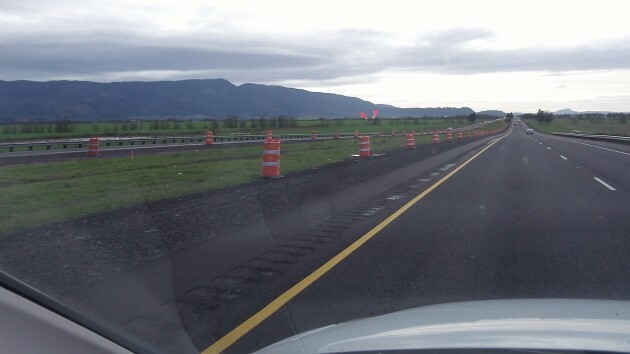 In November the Oregon Department of Transportation awarded a $7 million contract to K&E Construction of Salem to build the three-strand barrier along 42 miles of I-5 through Linn and Marion counties. ODOT said the contractor would start in Salem, finish that job by the end of January, and do the Linn County segment next, hoping to finish in March. By Saturday, though, the barrier project was well under way, having reached several miles north of the Harrisburg exit, the end of the existing barrier coming up from the south. The barrier is supposed to prevent cross-over crashes of the type that killed three people near Albany and Salem this year.